I offered the child the hem of his own shirt. He looked at me, grinned, then bit his own shirt. He walked around with his shirt in his mouth for a few minutes, then was done. 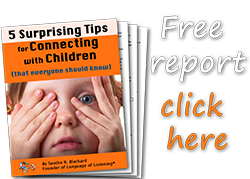 First SAY WHAT YOU SEE® to connect with children. When you see a behavior you LIKE, add a STRENGTH. When you see a behavior you DON'T LIKE, add a CAN DO. "Like" and "don't like" are coaching boundaries. They tell you which way to go when you move from the step of connection (SAY WHAT YOU SEE) to the step of guidance (STRENGTH or CAN DO) to facilitate personal growth. If staying calm and coaching children like this is hard for you, it may be because you don’t see things in terms of what you like or don’t like, but rather in terms of good or bad. Good/bad are judgments that were taught to most of us as children and are loaded with shoulds like these: you should do this, not that; you should be good, not bad. "Doing" translates to "being" in children's minds, so heaven forbid that you would want to “do” something your parents decided was bad because then you would “be” bad. "Bad" as a judgment feels bad to you and to your kids, which is why setting boundaries based on good/bad can make staying calm very difficult. Like many shoulds, "good" and "bad" are learned and become external forms of guidance. "Like" and "don't like" are internal. They come with your unique package of being human. But when you are trained to ignore your internal guidance and replace it with external shoulds, your awareness of your internal compass weakens and can leave you confused about when to act or not, and what boundaries to set. I’ve met more than one parent who thought they didn’t have any boundaries at all, though there were plenty of things happening around them that they didn’t like. One parent in particular was delighted when I helped her discover she actually already had a boundary. She would put up with her young child hitting her because it didn’t hurt, but when it did, she got angry and stepped away immediately. She had somehow learned that hitting was OK until it hurt, at which point it became “bad” and warranted a boundary. Once she realized she actually had a boundary that she wouldn't allow anyone to cross (hurting her), she tried setting another and another. Over time she was able to train herself to recognize things she didn’t like sooner so she could set boundaries well before situations got “bad.” She feels like a completely different person now, and so does her child. Check this for yourself. Do you worry about what other people think more than how you feel when you are setting a boundary? Are you concerned about your choices being "good" or "bad"? Are you afraid you don't have any boundaries at all? Beyond being learned, "good" and "bad" are highly subjective. What is good for one person may be bad for another. Good/bad are value judgments that change based on the situation and the outcome. An ancient Taoist folktale demonstrates this beautifully. Here is the version told by Anthony de Mello in Sadhana, a Way to God, (Random House, 2011) p. 140. Note: The “May be” version of this can be found in Tao: The Watercourse Way by Alan Watts, (Pantheon, 1975) p. 31. Not only are "good" and "bad" subjective, they are a form of social agreement, which is why it makes sense that when setting a boundary with your child or another adult, you might still look around to check what others think. After all, as a child, something you thought was good (like playing in the mud or with your food, etc.) could easily have been bad according to your mother. Checking with others is a hard habit to break, until you reconnect with your inner compass. When you recognize that “like/don't like” are actually your solid truth, all you need to do is look inward to check. When your boundary is just true, not a judgment or criticism of others, you can claim it without heat. 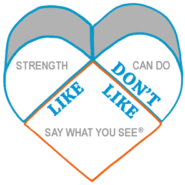 Calm cool boundary-setting is possible when you trade "good/bad" for "like/don’t like." This week, try switching “good/bad” to “I like that/I don’t like that” in your everyday conversations with your kids, other adults, and yourself, and let me know what you discover. sandy, I just found you. I can feel how important your work will be on my life and in my relationship with my son. I am so grateful for the work that you have created. Thank you so much.